Well, well, well. While the moviegoers of Champaign-Urbana will be flocking to the Virginia Theater later today, Wednesday, April 18, for opening night of the 20th annual Roger Ebert’s Film Festival, during which University of Illinois alumnus and Hollywood director Andrew Davis will introduce his 1993 smash hit THE FUGITIVE, we relish the thought of welcoming home another movie runaway. Chicago area native Lee Jones has given us permission to share that his prolific boutique distributor and streaming service, Vinegar Syndrome of Bridgeport, Connecticut, will restore the UIUC student-made feature SHOT and release it on Blu-ray disc later this year! 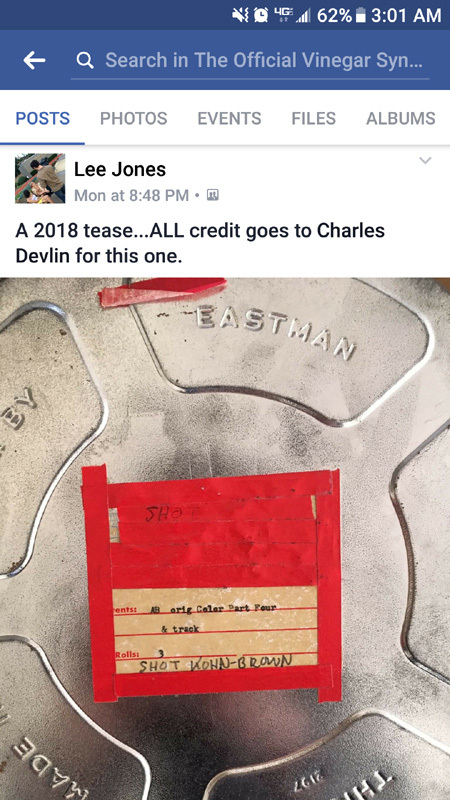 Although not yet announced in any formal sense, the acquisition of SHOT was first teased on social media last July; eagle-eyed C-U Blogfidential friend Jeff Kacmarynski (DREAD FLUSH) caught this reveal via the film canister photograph seen above and below. The container’s label clearly sports the names of UIUC graduates Nate Kohn, the long-standing director of “Ebertfest” and a professor at the University of Georgia in Athens, and Mitch Brown, a veteran lieutenant colonel in Civil Air Patrol training and son of the late novelist Dee Brown. They served respectively as producer and writer/director on SHOT, a massive undertaking for the student group Cinemaguild that premiered 45 years ago on March 28, 1973, at what is known today as Foellinger Auditorium. Until now, the project’s only official distribution has been on VHS cassette through various home video labels worldwide; you can see packaging examples at the end of this post from Sony Video Systems in North America and Xtasy Video Ltd. in the United Kingdom, both dating from 1987. SHOT may be an unusual addition to the Vinegar Syndrome catalog, dominated as it is by comedic, horror, urban, and hard-/softcore fare from the 1960s through 1980s, but its rescuer finds value in its tangible nature. “I tend to dislike actioners, but this one really impressed me,” wrote Jones alongside the teaser photo on the Facebook fan page devoted to his company’s product. “It has a Peter Yates quality, where it’s less into lengthy shoot outs (although the action set pieces are marvelously staged) and more focused on day to day life drama of the main characters. It’s really the eye for detail that got me,” he explained. No other specifications have been mentioned other than SHOT will be presented full frame, the 4:3 width-to-height ratio that had been standard for television screens for decades, and transferred directly from Brown and Kohn’s 16mm print. We will certainly let you know when the pigs – er, officers Ross and Wilson – are back on the beat to clean up as best they can “a world of perpetual winter/cold, industrial strips, ugly farm country, and grey skies” per Jones, who is both co-owner and director of acquisitions at Vinegar Syndrome. Other recent titles from them you might be familiar with are LIQUID SKY (1982), a stylish New Wave tale of aliens indulging in the New York nightlife, and SWEET SWEETBACK’S BAADASSSSS SONG (1971), the controversial proto-“Blaxploitation” epic. You may also remember when “Ebertfest” screened BAADASSSSS!, the entertaining homage to the latter, back in 2005; will SHOT receive a dedicated hat tip once it’s reintroduced to the cult and genre audiences of today? p.s. 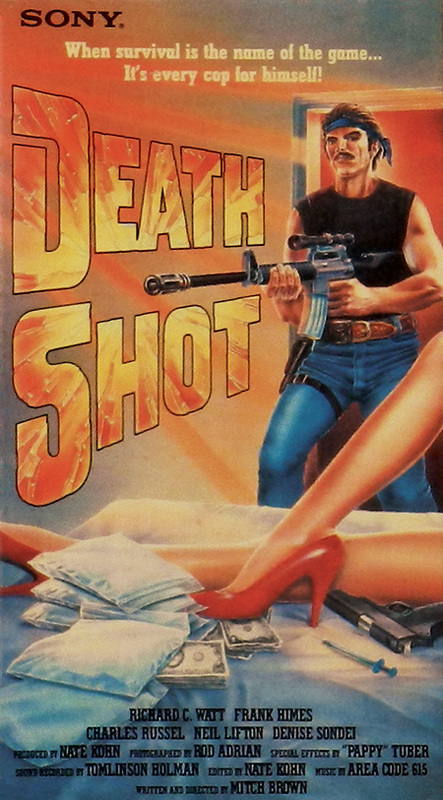 There is no truth in advertising when it comes to the prior box art for SHOT. Sony’s illustration plays on the fanciful military/action films of the 1980s while the crude still adorning Xtasy’s clamshell is borrowed from a completely different film, THE CANNIBAL MAN (1973). Bizarrely, labels in several European and South American countries used pictures of a male model dressed like the ersatz mercenary on the Sony box; one sample materialized on the film’s IMDb page a few months ago. p.s.2 “Vinegar syndrome” is a term used for when the plastic in cellulose acetate film stock begins to decay. 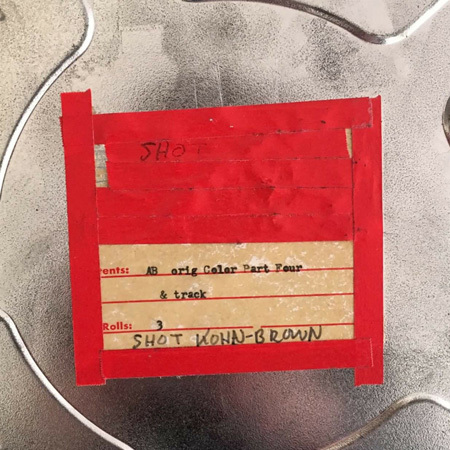 You can learn about this and dozens of other things on the neatly organized “Film” page of the Preservation Self-Assessment Program, developed by the University of Illinois Library as a tool for archivists to use in helping prioritize how to safely store their own collections. This entry was posted on Wednesday, April 18th, 2018 at 11:00 am	and is filed under Happy Places, Home Videos du C-U, Ones That Got Away?, Student Film, The Old School. You can follow any responses to this entry through the RSS 2.0 feed. Both comments and pings are currently closed.